1 in 5 people are diagnosed with OA but 1 in 3 obese people develop OA. More than 27 million people are diagnosed with OA every year. Every pound of excess weight exerts approximately 4 pounds of extra pressure on the knee joints. To lose 1 pound of body weight, you have to “burn” approximately 3500 calories. If you develop painful joints, seek the advice and treatment from a Physical Therapist. According to The State of Obesity: Better Policies for a Healthier America released in September 2016, Washington, D.C. now has the second lowest adult obesity rate in the nation. Click here to to know the obesity rate of your state. Does gaining weight and being “over-weight” cause more joint pain in the body? Osteoarthritis is one area where we see an increase in joint pain due to weight gain. The frequency of Osteoarthritis (OA) in the obese population is 1 out of 3 people, but some obese people struggle to see this think. Why? Because they have carried excess body weight for a long time and only now are beginning to experience pain. Healthcare professionals work with obese patients to help them lost weight and life a healthier lifestyle. The fat or adipose tissue is being studied a great deal because it is thought to release chemicals (cytokines specifically adipokines) that can lead to an increase in inflammation throughout the body and joints. The inflammatory response has been linked to the development of OA throughout the body. These chemicals and the inflammatory response can cause pain and increase the difficulty of treating many conditions such as Rheumatoid arthritis. The joints of the body are the union of 2 or more bones that move or articulate together. The ends of the bones are covered with a smooth, articular cartilage (hyaline cartilage) that can “wear out” and get damaged over the course of one’s lifetime. If the damage or arthritic change is great enough, the joint will hurt and in the worst case scenario might have to be replaced by an orthopaedic surgeon. The joints of the body are subjected to shear and compressive forces with every movement. These forces are handled by static and dynamic stabilizing structures around the joint, but the increased force placed on the joints of an obese person can be too great to handle. The frequency of Osteoarthritis (OA) in the obese population is 1 out of 3 people! The joints that are most frequently affected are the weight bearing joints such as the hips and knees. Once patients begin to suffer from OA and other forms of joint pain, they are less active. This inactivity leads to more weight gain, and this cycle is not good for their joints or general health. Losing weight and maintaining a regular exercise routine will help to increase the quality of one’s life. Exercise and diet must be linked to be successful at a weight reduction program. To lose one pound, an individual has to “burn” approximately 3500 calories. Therefore, the best way to reduce body weight is to eat less and exercise. One major problem with healthcare professionals that treat obese people is the inability of the person to perform exercises due to their joint pain. 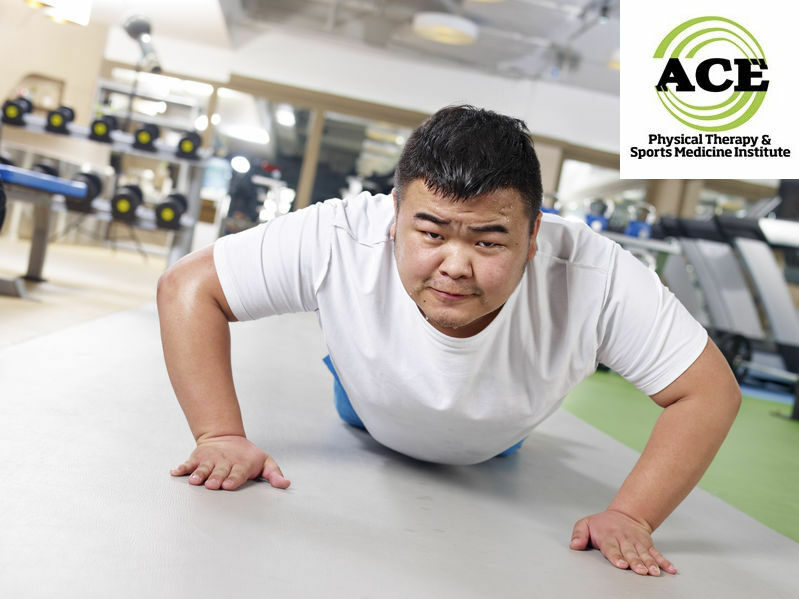 Physical Therapists are well versed in developing these programs for the injured or “hurting” obese person. The focus will be to get the injured or painful joint or joints moving. There will weight bearing and non-weight bearing exercises that will help restore as much motion and function as possible. Many times if the person is able to increase the activity and function of the dynamic stabilizing structures (muscles) around the involved joint (s) the person will perceive less pain and be able to move more freely. Many studies indicate that the nerves and muscles do not communicate very well in the presence of inflammation and pain. If the re-education process can stimulate an increase in neuromuscular activity, there is a good chance that the patient will experience less pain and increased function. Visiting a Physical Therapist is easy and does not require a trip to your doctor. Your insurance plan might require you to have a referral from your primary care physician but you do not have to have a doctor’s prescription to attend Physical Therapy. An over-weight or obese person can develop a host of health-related issues that can lower the quality of life. Joints are subject to added stress and strain due to added body weight and changes related to specific chemicals that are released from adipose or fat tissue. The chemicals can increase the amount of inflammation within the joints and cause pain to occur. The best solution, but certainly not the easiest is to lose body weight, gain neuromuscular control and gain strength throughout their musculoskeletal system.